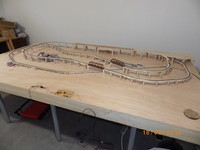 The next step will be the track on the rear straight ramp, then the upper station (on a piece of 10 mm plywood, it will come "over" the ramp, so I had to wait). 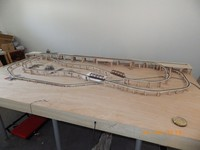 Probably I will add a yard track to the "lower" station, to display my locos which are not in use (2 or 3), "dead" i.e. 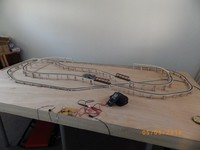 turnout inactive and track without power ; exchanging will be performed by "the master's hand" . Wonderfull! It is a really interesting design. Lot of room for the nature around and no tight curves. 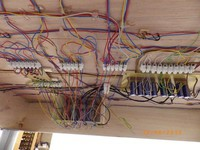 I see a lot of feeder wires. I wished i had done it in this way. Show us more please! The layout is a simplified version of my former N-Layout (which was fully "double track", with operational DB signalling, 55 signals, a "gaseous plant" ) ; the most interesting is that it allows a "real" (passenger and freight) traffic between two stations ... even if they are only distant about 240m (scale) "as the crow flies" ; and I think that, if a train runs the full circle, it is a significant distance and time for a freight train at scale speed, too. sometimes ago, there was an article in the Modell Railroader magazine dealing with typical mistakes in rlayout planning. They say that the distance between two stations should be a minimum of 1 1/2 train lenghts. My trains are (max.) 3 meters long, so I need a distance of ( min.) 4,5 meters which I can manage. In your case, this requirement is easily done! Tunnels make the way visually longer as it is and the curves slow done too. Your concept is perfect. My freight trains cannot exceed ~55 cm including the locomotive(s), due to the length of the tracks (don't forget, it should not be a "main line" ) ; and the "Double Budd" is only 24 cm all the way. My concept is ... 38 years old ! The tracks for the "long" ramp have all been mounted (the upper station will come "over" them, they will still be accessible from the rear), all tracks are connected together beneath the layout. Metallic legs (adjustable) were mounted, instead of the first wooden versions (two versions needed to be tested). 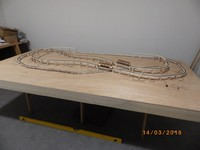 In the middle of the layout, the remaining R270 curved tracks which are missing to finish the layout (with already soldered feeders) ; the upper ends of both ramps will be mounted after the upper station (the next step). In the foreground, my test circuit for (progressive ! ) speed control ! The next step ... The "upper left curve" is not yet screwed in place (it's only a test)! 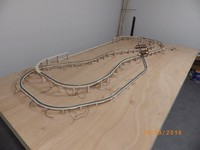 All tracks are in place, some structures have been temporarily placed, there will be longer platforms (3D prints) for the Budd's ; the bumpers are not yet painted and fixed, and the trains cannot run (excepted away from station areas) until all wires of both stations will be connected (see the upper station ! ) ; the layout uses 34 (!) insulators. 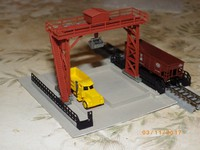 The loads in the hoppers will be painted gravel grey, the gravel "unloading" facility (not yet finished, see picture) is shown at the freight track in the lower station ; the design of this station has been slightly modified from the original project. And now I am working in the "underground" ... 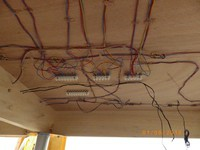 I use "conventional wiring", no bus system. Next step, connecting the 8 turnouts and installing the PCB's for the relays and the capacitors for the turnouts (already assembled). And then a box for the control panel, with inside the position detecting circuitry, the interfaces for the relays, the speed controller board, the microcontroller, and perhaps a display ... with nixies (vintage forever ! ) if the high voltage does not cause interferences (countdown before next train start when layout is in automatic, random mode) ... As power supplies I will use switching versions by MeanWell and PhiHong, mounted under the plate. And then intensive tests, before I can go on with the landscape. 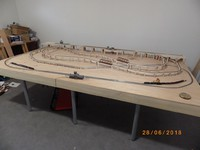 My last post concerning my layout was more than 2 months ago ... This is because I am presently still working on the control panel. I had to order the console (plywood with melamine finish) at my local carpenter (some things need special tools and machines to get a "professional" finish), and I am waiting to get it. And I am waiting for the last PCB's, too, the "CAD" phase is completed since a week, I think they will be delivered in about 10 to 12 days. I built the power section (OPA547 based), the detectors for 5 sections and controls for the relays, and the speed controller. 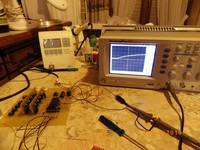 I add a photo of a "test run" on my workbench (= kitchen table ), where automatic acceleration can be seen : look at the curve on the scope ; some "noise" should not cause issues ; the first "minimal" test version mounted on Veroboard, on the picture of May 5th, worked fine. There are 3 groups of 5 trimmers, 1 group per train. 4 trimmers are for 4 selectable speed presets, the fifth for "momentum" (individually adjustable for each train). The group at the left is for the "Budd"'s (always in use), the groups for the freight trains are mounted on plug-in boards, to allow swapping of locomotives. 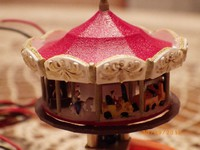 The missing PCB's are for the control keyboard, the main microcontroller board (Atmel 8515) and another sequencer board (ATTiny13 based) to switch my 3 "merry-go-round"'s, which I ordered together with them : there will be a funfair (or "carnival" ), in my town : look for "periocus" on Shapeways, he provided the 3 motorized carousels. Unfortunately I had to give up the idea of a "vintage" control panel, there were too many "holes", and to be accurate they needed CNC machines which were not available. So I ordered online (at Schaeffer AG, Germany) a single, smaller, CNC drilled and milled, and printed aluminium plate, which will be fixed on the console, the only control elements being 2 tumblers and six digitasts ; I was first afraid that the feedback led's wouldn't be visible, but I found some high luminosity models by "Lucky Light" which solve this problem.